Wait a second! Pink sapphire did we say? And you did think that sapphires are only supposed to be blue, didn’t you? Well, here’s one of the lesser known truths about sapphires that people are still about to dig. Sapphires exist in a potpourri of hues ranging from green, purple, and orange to pink and of course blue. The pink sapphire, blessed with its soft, simmering charm and its pale pink appearance is often termed as the girly sapphire. At the same time, sapphire as a stone is one of the hardest specimens out there, with its tenacity seconding only to the diamonds. 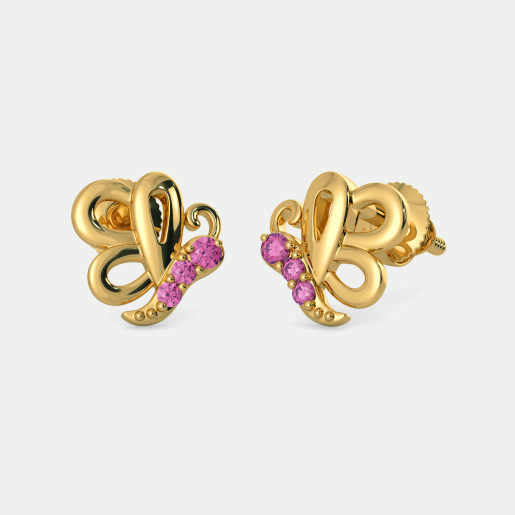 Thanks to the diverse nature of the pink sapphire earring designs, they are deemed to symbolise the velvet glove, and are counted upon as one of those rare, expressive bit of jewellery that resonates with the notion of feminine strength. Have that invincible spark lurking inside you? Here are some of the most exquisite pink sapphire earring designs that will help you express your element, tinted in chic fashion. Jewellery is not a mere adornment of the appearance, is it? It is the expression of the self. Your jewellery secretly reveals those clandestine traits of your character that you would never openly give away. 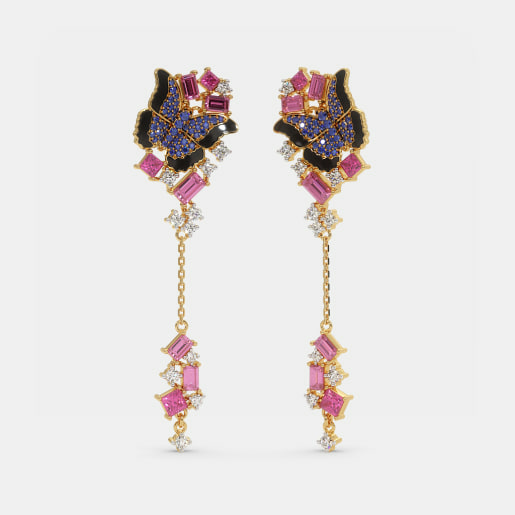 So if you are going to make a profound statement with your earrings, (mind you they are the first piece of jewellery that grabs all the attention) you better deck them with the subtlety and finesse of pink sapphires. That’s where the Adela Earrings come in. Everybody enjoys a little twist in the tale. And that is what the Adela Earrings are made of. The winding patterns of these earrings make way for a pleasant surprise. 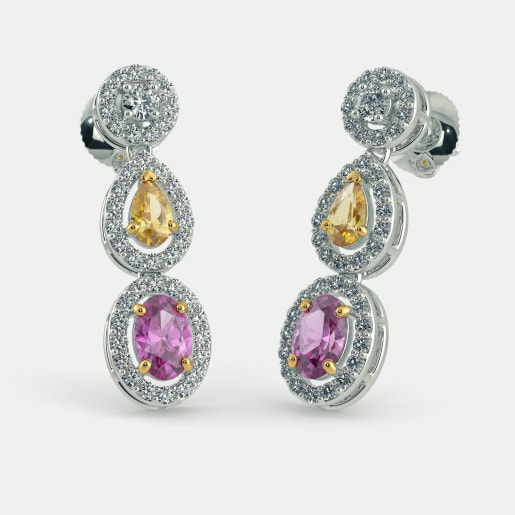 These 18kt white gold earrings are tastefully embellished with the glimmer of diamonds and the mellowness of pink sapphire. The intricate design tastefully reveals the unpredictable in you. The Murciella Earrings are decked with posh panache and impeccable style. 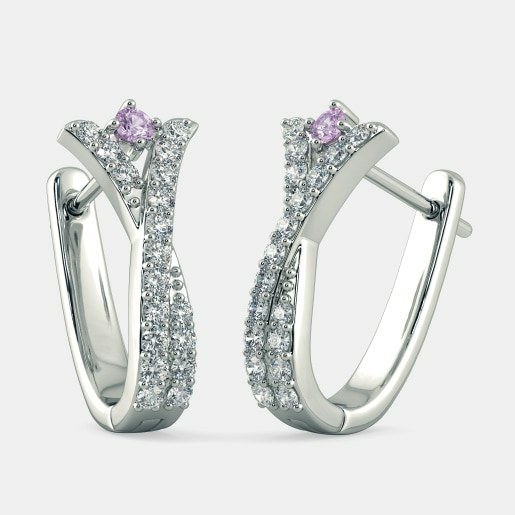 Reveal the elitist in you with this pair of 18kt white gold earrings, which is bestowed with the simmering brilliance of the diamonds embedded into it, and not to mention the romantic charm of the purplish-pink sapphires. Wear it on a date and play his heart to the haunting tune of your pink sapphire earrings. Wear your elegance to your office and make heads turn at work with the Safyra Earrings. Short, sweet and simple, these earrings make for the perfect blend of style and status that complement your corporate work wear. 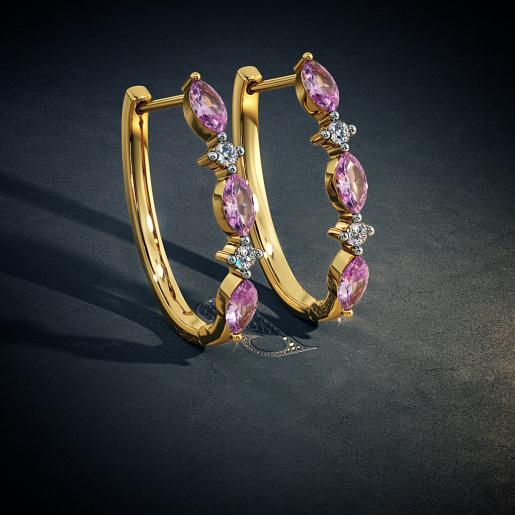 Adorned with amethyst and pink sapphire, this pair of earrings has nothing mediocre about them. From a classy dazzle to a sober fashion sense, these earrings are imbued with every single quality that will make people look up to you. The Angelyn Earrings borrow their brilliance from the blithe beauty of bougainvillea flowers and the exquisiteness of pink sapphires. 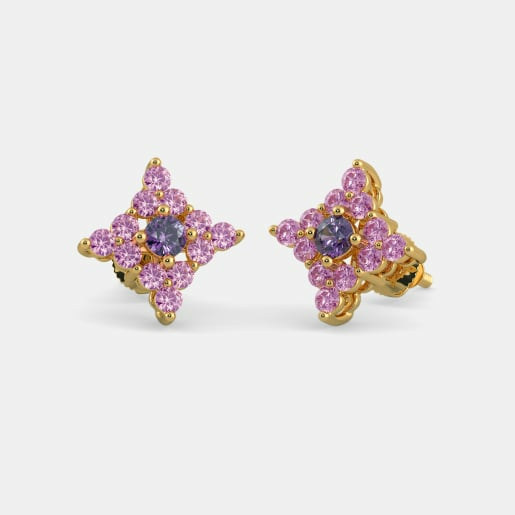 The purplish pink hue of this pair of earrings works wonders and soothes every pair of inquisitive eyes that pauses to ogle at it. These 18kt gold earrings are strategically punctuated with the luminosity of diamonds to add to their charismatic charm. At BlueStone, we understand the heart of the jewellery and of those who wear them. With our understanding and expertise, we create fine jewellery that is uniquely us. Explore our diverse and enchanting pink sapphire earrings collection and buy the pieces that win your heart. 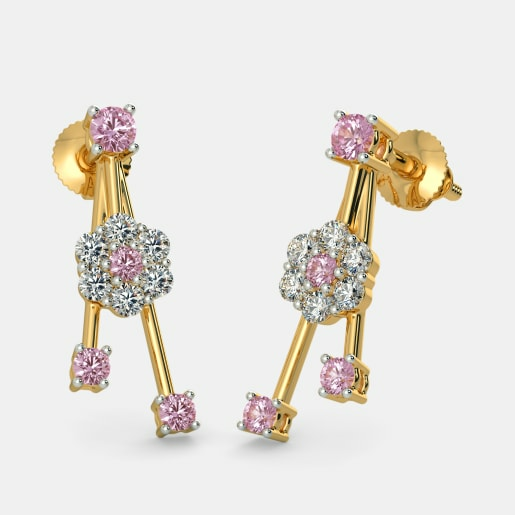 May you dazzle your way to the stars and back with our enticing pink sapphire earring designs. Here you will definitely find something or the other that will match up to your taste, no matter how unique and unpredictable you are when it comes to jewellery. You can now check and compare our pink sapphire earring prices and buy the one that fits you the best. And don’t worry about how it will look on you. Once you have taken your pick with our choicest jewellery designs, we can bring them home to you for you to try on. Rest assured, there is no additional charge or compulsion of purchase lurking in the corner with our home try-on service.